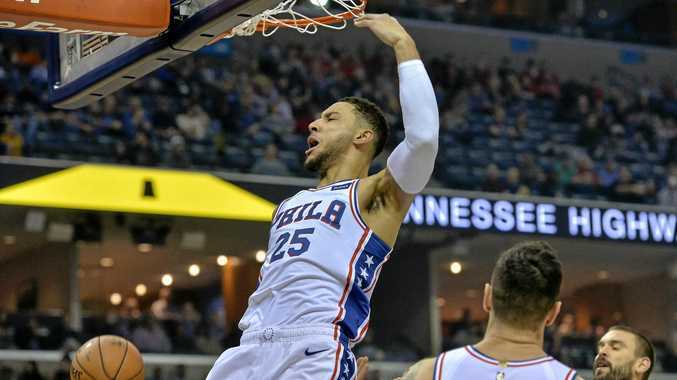 TWO Ben Simmons turnovers in overtime and a number of missed open shots by his Philadelphia 76ers teammates resulted in a 112-106 NBA loss to the Memphis Grizzlies on Sunday (AEST). Simmons had 18 points - on nine of 15 shooting - and 14 rebounds in another double-double performance but he was stripped of possession twice in overtime as the hosts finished strongly against the short-handed Sixers. Mike Conley scored a season-high 32 points, including 21 after half-time, for Memphis, who are unbeaten at home. The 8-6 Sixers were without regular starters Robert Covington and Dario Saric, along with reserve Jerryd Bayless, who did not play as news broke hours earlier that they would be traded in exchange for Minnesota Timberwolves' wantaway All-Star Jimmy Butler. Joel Embiid recorded his league-leading 13th double-double with 14 points and 16 rebounds but failed to hit some crucial three-pointers in overtime. Meanwhile Kevin Durant had 28 points and 11 assists while Quinn Cook scored a season-high 27 in place of the injured Stephen Curry to help the Golden State Warriors get by the Brooklyn Nets 116-100. Klay Thompson added 24 points on an uneven shooting night as the Warriors won without Curry and Draymond Green. Pascal Siakam scored a career-high 23 points while Jonas Valanciunas had 19 points and 10 rebounds to help the Toronto Raptors beat the New York Knicks 128-112. The victory improved the Raptors' league-leading record to 12-1. Lou Williams hit a jumper with 0.3 seconds remaining in overtime to give the Los Angeles Clippers a 128-126 win over the visiting Milwaukee Bucks. Montrezl Harrell led the Clippers with 26 points off the bench while Patrick Beverley added 21 points and Tobias Harris had 20 points and 11 rebounds. Giannis Antetokounmpo had 27 points and 18 rebounds for Milwaukee, who are 9-3 and second in the eastern conference behind Toronto. LaMarcus Aldridge had 27 points and 10 rebounds to guide the San Antonio Spurs to a 96-89 win over the Houston Rockets. The win lifted the Spurs to 7-4, level with Memphis in the west, with the Rockets slumping to 4-7. Anthony Davis had 26 points and 12 rebounds as the New Orleans Pelicans defeated the Phoenix Suns 119-99 in their western conference showdown to take their season record to 6-6. Zach LaVine scored 24 points as the Chicago Bulls held on to defeat the Cleveland Cavaliers 99-98. John Wall scored 28 points to lead the Washington Wizards to a 116-110 win over the Miami Heat while Dallas were too strong for Oklahoma 111-76. In the day's final game the LA Lakers beat Sacramento 101-86.